China is one of the original places of water lily in the world and the Chinese Lotus culture has a long-standing history. For hundreds of years, many men of letters devoted themselves to the beauty of lotus, some of them wrote poems about lotus, some others wrote songs about it; they left numerous poems, paintings and calligraphies about lotus; of all the artistic works, many are the creams of the Chinese culture. A famous poet of the Tang Dynasty, Yang Wanli, wrote in his poem: "June in the West Lake is different from other seasons of the year, the lotus leaves are extremely exuberant, and the lotus flowers are more red against the morning sun". "As soon as the buds of lotus appear on the water surface, the dragonflies begin to stay on them". Water lily is a vivarium herb. In China, lotus has rich connotations. First, lotus is regarded as the symbol of the holy and the pure. Lotus has countless ties with Buddhism, so to speak, in Xishuangbanna, all the local folks believe in Buddhism, and all villages have Buddhism temples; lotus is one of the Five Trees and Six Flowers to be planted in temples, thus, is planted widely. Secondly, lotus is regarded as the symbol of beautiful things. Another great poet of the Tang Dynasty, Bai Juyi, once described the good looking of one of the four ancient beauties, Mistress Yang as: "her face is like a lotus flower, and her brows are like the leaves of willows, how could not we be unmoved facing them". "A lotus flower just rose up from under water" is a phrase used for praising a particularly pretty girl in China. Finally, lotus is used to describe upright and honest gentlemen, thus, lotus also has the fame of "gentleman in flowers". Lotus is full of treasures. Its roots are white, which is rich in starch contents; the roots grow in mud, they grow very long and are quite fat, and full of holes when cut in sections. Its seeds are elliptical and are as big as peanuts. The roots and seeds are eligible and are quite nutritious foods. The lotus leaves are round, the surface of the leaves are green and the back are dark green, and the leaves could be used as tea, and it is also a very good packing material. In Xishuangbanna, the local people often use Lotus leaves to wrap fish, mean and sticky rice to make delicious food; in the May 5th Festival, local people would use the lotus leaves to wrap dumplings. Lotus flowers are very big and the shapes of the flowers are varied. The colors of flower are include red, pink, light yellow, and white etc. The roots, leaves, stalks and seeds of lotus could all be used as medicines and could remove fever and stop bleeding; and lotus seeds could tonify kidney etc. 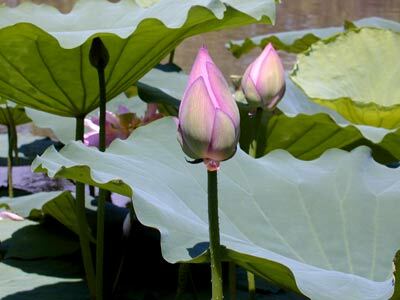 Lotus are planted in all provinces of China, and they are usually planted in ponds or water fields. They also scatter in Russia, Korea, Japan, India, Vietnam and Australia etc.